These jeans are proof that shizz always comes back around to be cool again...and this is the exact reason I have a hard time getting rid of things! Some would refer to this problem as hoarding but I like to think of it as a 'value conscious' decision...I mean, I just saved myself from having to buy a new pair, right?! Right. Well folks, I do believe I just pulled into the station of justification. Whatever works. Anywhoots, they made for the perfect pairing with my cozy cut out cardi and my favorite Equipment shirt..you can seriously never go wrong with Equipment. They always manage to make you look extra chic and way cooler than you probably think you are. No joke. Gearing up for a fun yet busy weekend ahead of me with birthday parties and two fun events! Seriously I wish I could fit into my old jeans. Your jeans and sweater are awesome! I also have a very hard time getting rid of my clothes because they always come back into style :) Looking gorgeous! OHHHH that sweater is AMAZING on the back!! those jeans look so fabu on you nicole! So 70's chic! The jeans are so flattering on you, and the back detail of the cardigan is mesmerizing. Hola preciosa, como siempre... muy elegante!!!! The sweater is fabulous! love the unexpected detail in the back. I love this on you - that sweater is amazing! Such a cute look! Love how western it looks! Loving the cut of those jeans and the back of that cardi is an excellent surprise! Honey, if you've got it (which you DO! ), flaunt it! I swear Frankie B's are like a disaster to get in and out of for me...that low waistline, the super tight hip action...but those flares, THOSE flares are unbelievable! You sure are rocking the *ish outta em! She's a keeper fosho Nic! Totally your style! Totally agree with 'hoarding' clothes to wait for the trend to run full circle. Love this outfit! Have a great weekend. 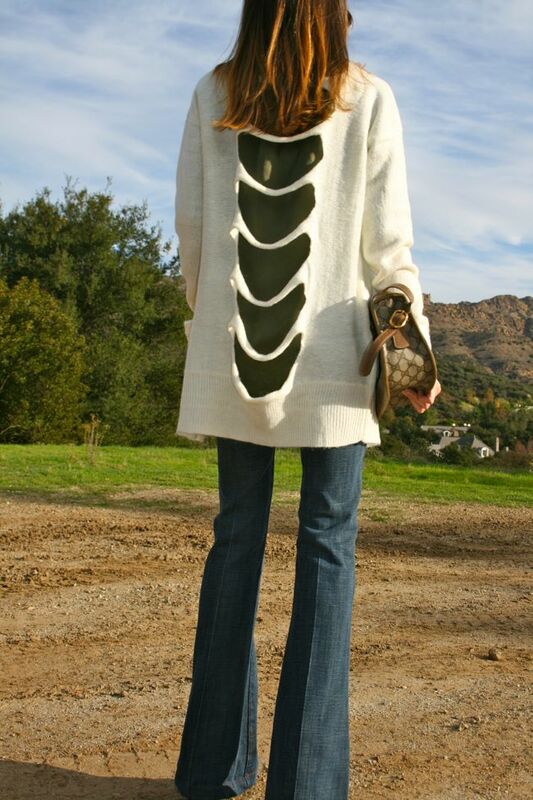 The sweater has a unexpected surprise on the back. Like it! I really need to adopt your mentality of hoarding clothing I am continually cleaning out my closet and reselling stuff to crossroads trading. I need to break this habit because as you mentioned, things DO come back into fashion. I actually did buy new flared jeans!!! (for 30 dollars but still! I could have spent that money at Shop Frankie's! now that's an outfoit u'd see me in all the time!!!! I'm totally with you, girl! I hate parting with clothes...they always seem to come back around! Just gotta get a bigger closet! Adore that sweater so much. I don't like getting rid of things, but I don't consider myself a "hoarder" either... I just don't shop a lot, and mostly buy timeless pieces I know I'll almost always wear! Love that color of green!! And the cut-outs are really cool! the outfit is simple yet chic. Love the back of the sweater and those jeans are amazing (great save!)! Absolutely love this beautifully laid-back look on you. Very stylish . . .
Haha, I was waiting to see where the cut-outs came in. Cool surprise, love the cardigan. I think it's great that you have a St. Jude's badge on your blog! what i love about your style is that i can adapt it into my own. Mostly Im a hoarder but sometimes I need room when I am literally pushing the hangers with one had and shoving a new one in with the other, thats when my cupboard gets a clean out. I love that cardi, just brilliant. Hello there sweetie! I just found your blog; Congrats, I love it! Great post! Would you like to check my blog and why not follow each-other? Follow me if you like, let me know by comment and I’ll follow you right away! 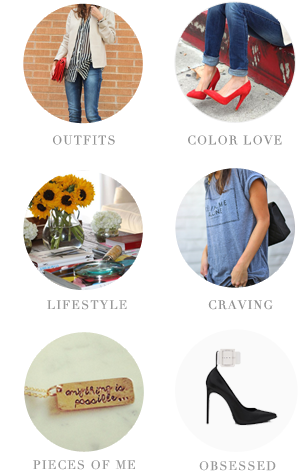 We can follow each-other with Bloglovin' 2! Ohh amazing sweater !!! love it ! !I'm new to blog, check out my blog and follow if you like. I def follow your. love this cardi! what size did you buy it in?